Scientists at PNNL used a novel combination of techniques to reveal how carbon dioxide (CO2) injections that could reduce greenhouse gas emissions could affect sulfate-reducing bacteria catalyzing a key biogeochemical process in the deep subsurface. Ultimately, these findings offer an insight into the effects of CO2 sequestration on indigenous microbial populations, and could lead to new strategies for improving the success of CO2 sequestration, thereby helping to reduce climate change. Enlarge Image. Results: A recent study used a novel combination of techniques to reveal how carbon dioxide (CO2) injections—a process that could reduce greenhouse gas emissions to the atmosphere—could affect sulfate-reducing bacteria that catalyze a key biogeochemical process in the deep subsurface. Ultimately, these findings offer an insight into the effects of CO2 sequestration on indigenous microbial populations, and could lead to new strategies for improving the success of CO2 sequestration, thereby helping to reduce climate change. Combining novel high-pressure nuclear magnetic resonance spectroscopy and transcriptomic measurements, researchers from The Ohio State University and Pacific Northwest National Laboratory (PNNL) tracked the response of a model sulfate-reducing bacterium, Desulfovibrio vulgaris, to CO2 exposure under a range of pressures. Their findings suggest geologic sequestration of CO2 may significantly inhibit sulfate reduction in deep subsurface environments where this metabolism is a key respiratory process. This effect may help limit harmful subsurface processes such as sulfide-induced corrosion, mineral precipitation, and injection-well blockage, thereby improving the overall efficiency of CO2 sequestration. "Although pressure itself had no negative effect on the health of the microbes, some microbial activity was significantly impacted by CO2 exposure, even at relatively low pressures," said Dr. Michael Wilkins, Ohio State University, who led the study while at PNNL. "In particular, cell growth was limited and respiration ceased under all conditions of pressurized CO2 exposure, which disrupted the integrity of the cell membrane. However, the cells initially remained viable and continued to transcribe genes at all CO2 pressures." Why It Matters: CO2 sequestration in deep subsurface environments has received significant attention and investment as a way to reduce greenhouse gas emissions to the atmosphere. However, relatively little is known about the effect of CO2 on the microbial community in the deep biosphere—the largest biosphere on earth. The research team's findings suggest CO2 injected in subsurface systems likely acts as a driving force for shifts in microbial community structure, which in turn could influence efficiency of the CO2 sequestration process. What's Next? The study paves the way for future research aimed at further examining mechanisms that inhibit the activity of microbial populations to improve CO2 sequestration. 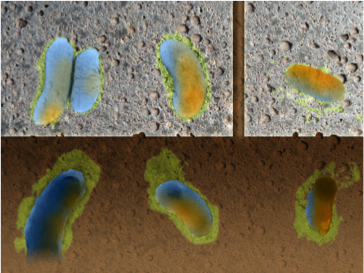 Moreover, this work could be a foundation for understanding how some indigenous microorganisms survive in conditions of high pressure levels and CO2 in deep subsurface environments. Sponsors: Portions of this research were supported by the Microbial Communities Initiative at PNNL. Extracellular polymeric substances characterization studies were funded by a U.S. Department of Energy (DOE) Office of Science Early Career Research Program Award to Matt Marshall. Remaining portions of this work were performed under a Science Theme Proposal using EMSL and sponsored by DOE's Office of Biological and Environmental Research (BER). Research Team: Michael Wilkins, Ohio State University; David Hoyt, Matthew Marshall, Andy Plymale, Meng Markillie, Abby Tucker, Eric Walter, Alice Dohnalkova, and Ron Taylor, all PNNL; former PNNL staff Bryan Linggi and Paul Alderson. Reference: Wilkins MJ, DW Hoyt, MJ Marshall, PA Alderson, AE Plymale, LM Markillie, AE Tucker, ED Walter, BE Linggi, AC Dohnalkova, and RC Taylor. 2014. "CO2 Exposure at Pressure Impacts Metabolism and Stress Responses in the Model Sulfate-Reducing Bacterium Desulfovibrio vulgaris Strain Hildenborough." Frontiers in Microbiology, Published online 25 September 2014.